2 Pairs of St. John's Bay Men's Flat Front or Pleated Front Pants $19.98 (Reg $60) + Free Store Pickup at JCPenney. 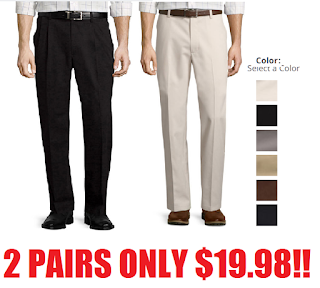 2 Pairs of St. John's Bay Men's Flat Front or Pleated Front Pants $19.98 (Reg $60) + Free Store Pickup at JCPenney. Great price at only $10 Each. If you don't want 2 then you can mix and match with other items to get your order over $25 so you can use the $10 off coupon.